I am posting today from the the temperate confines of Austin, TX. I am here to participate in a part of the SXSW music festival. It's a convention for rock poster artists called Flatstock. About a third of the illustration work that I do is screenprinted posters for rock shows` and for the past 5 years or so, I have participated in this event, selling my work. At the very least, I get to go to a warmer part of the country when I have just about had my fill of a Chicago winter. Boat-tailed grackles and White-winged doves are the predominant avian citizens around these parts. They both are a constant vocal presence, especially the grackles with their loud, piercing, metallic call. 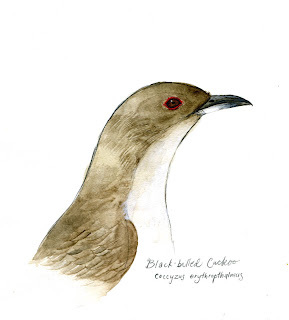 Last week, when at the museum, I prepared a Black-billed cuckoo. In appearance, it is very similar to the Yellow-billed cuckoo, with the exception of the bill color, and eye ring color. The eye ring on the Yellow-billed is yellow, while on this one, as you can see, it is red. Both are not uncommon birds, but are very secretive. The Black-billed will often eat spiny caterpillars. The spines will stick to the inner lining of their stomachs, and then the stomach lining is shed on a semi-regular basis. Cuckoos are nicknamed "rain crows" for their habit of cooing just before a rain storm. I had never seen either species of cuckoo until this year. I recall reading somewhere that their numbers in the Chicago area were possibly higher than in other years due to the seventeen year cicadas. The cicada abundance last summer provided a real gorge-fest for a whole slew of animals.